If there was one thing I hate about technology, it’s cable management. I always seem to have one cord that’s just an inch too short or has so much slack that makes it look like I have a jungle of vines behind my desk. 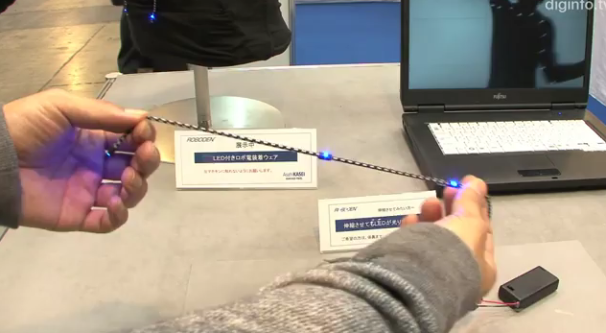 Well now Asahi Kasei Fibers, a Japanese manufacturer of Spandex, has created the world’s first elastic USB cable called Roboden. The cable can stretch to 1.5 times its original size, much like human skin. The outer shell of the cable is made of an elastic material, while the internal wiring is run in the form of a spiral. Besides being applied to common USB cables, the manufacturer also imagines seeing its stretchy cables make their way into robotics. Robots with articulating parts could be more mobile with wiring that expands and retracts like a bungee cord. Alternatively, it could be used to create less constrictive electronically enhanced clothing or at least a headphone cable that does not get blown around by the wind. Having experienced stretchy cables when we were still using wired landline phones (and when dinosaurs roamed the earth), I wonder how much tension I can put on Roboden before it pulls out of the USB port or it sends my MacBook flying at me.